Little did I know five years ago on April 30thas my family and I said “goodbye” to our precious Hannah that I would ever get over the hurt. Years had passed and the hurt began to ease a bit. My memories were no longer painful but simply brought me joy just thinking about the unconditional love and loyalty Hannah gave all of us. 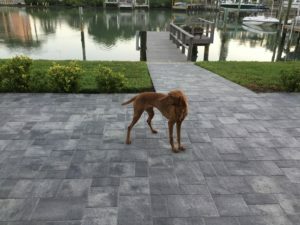 I began to long for the companionship of another Vizsla. Could I do it? 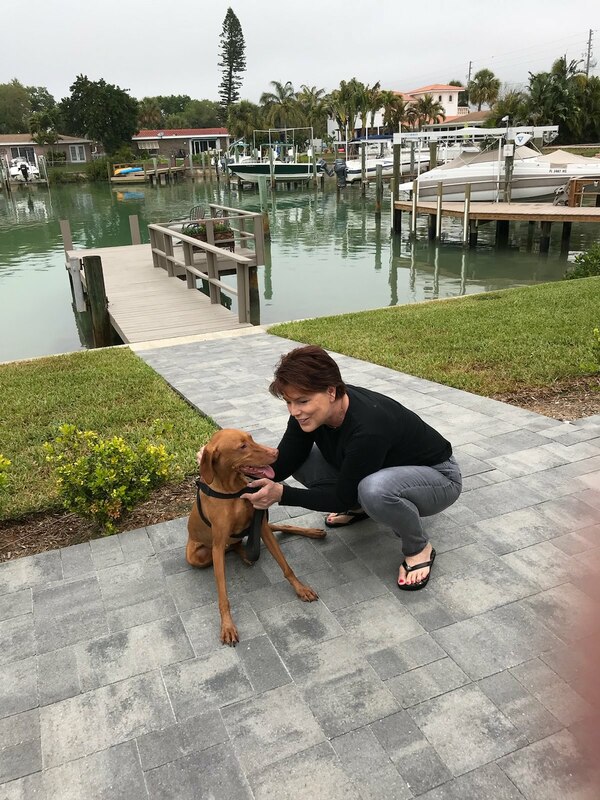 I reached out to Tampa Bay Vizsla Club and volunteered to act as a foster parent. My thinking was to see how it would go. 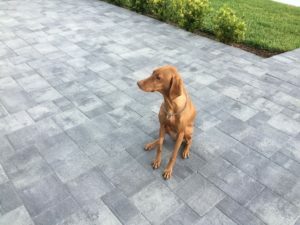 Well, fast forward…I finally received a call from Nicole that they had a female Vizsla and they needed a foster home for her. I gladly accepted after seeing her pics and knowing my heart was open. The volunteers who worked to get Sasha to me were amazing. I hadn’t had a Vizsla in years and I was, definitely, a bit nervous. Sasha came to me and we instantly hit it off. It was like a prodigal daughter returning home. The challenges she has faced since being here have been many. Her previous owner had selflessly given her up because he couldn’t care for her like she deserved so she was not unhappy there. She went through a transition at my home; not eating much but loving the runs and being outside. I spent a lot of time with her sitting next to me and talking to her. The neighbor dogs on both sides were equally as happy to see her come to my home. They too became quick friends. My daughter and son brought their 4 Australian Shepherds and she was in “doggy heaven” running and playing with them. 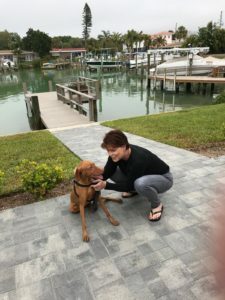 I was beginning to feel I could be more than a foster parent to her and she was opening up too. Then we found she had a very large mass. According to the Vet it was very suspect and needed to be removed. Nicole sprung into action decisively and the surgery was performed. It was a serious surgery and I really didn’t know if my heart would once again be broken. We waited a week before the call came from the Vet…”benign”. Sasha was just fine, other than being a senior (which was ok with me since I am too, haha). I emailed Nicole and asked her if I could adopt Sasha? I knew there was no way I would ever want her to leave. Now Sasha and I both have found each other late in life. I feel she, just like my Hannah, has an unconditional love for me and my family. 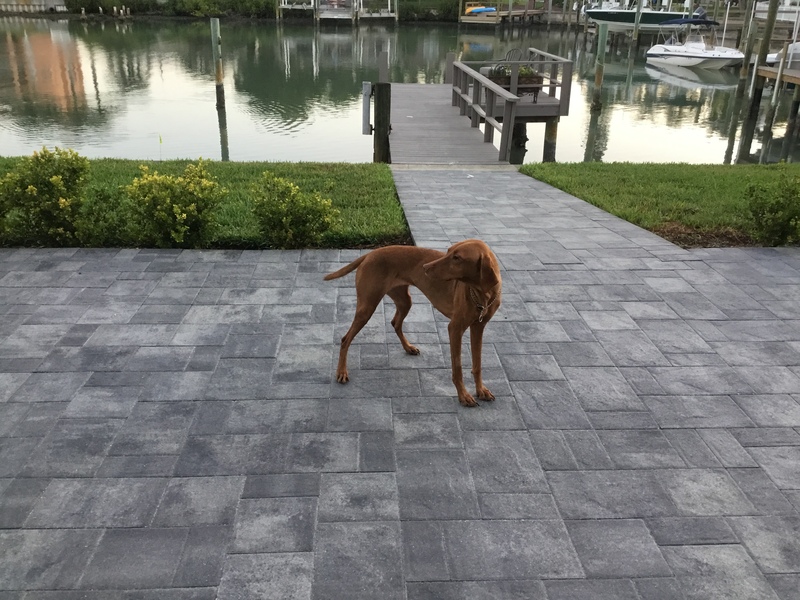 If I were to simply say “I am grateful” for Nicole and Tampa Bay Vizsla Rescue it would seem so inadequate. Sasha has brought back a joy in my life that I thought was gone forever but now I know is a joy only Sasha can provide. Thank you, thank you! !